I am one of the four breeds of Belgian Sheepdogs, and I bear a striking resemblance to the Groenendael. The only difference is the color of our coats. My coat comes in red, fawn, gray, and shades of all of those colors, usually overlayed with black. It is thick, with an undercoat, and requires not much more than regular brushing to keep it nice. Like my counterparts, I am an excellent family pet as well as a talented sheepdog. I am obedient, easily trained, and I like to please my people. As with any large, strong dog with guarding instincts, obedience training at an early age is strongly advisable so that we all understand the rules. I do need lots of exercise so it would be best for me to live where I have plenty of room. 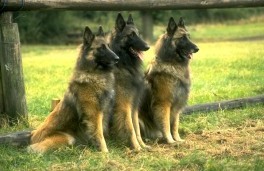 We have no Belgian Tervuren Breeders listed at this time. Click here to place your Belgian Tervuren Ad!